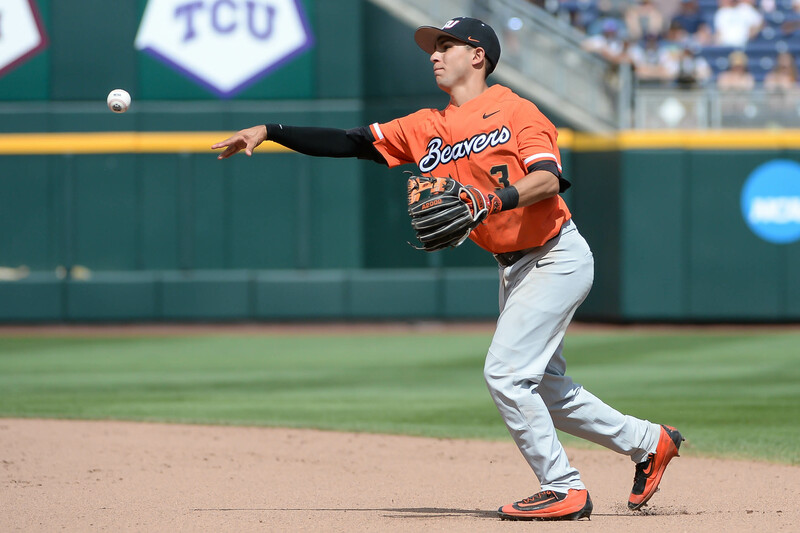 The White Sox selected Oregon State infielder Nick Madrigal with the No. 4 pick in the MLB Draft on Monday night, adding a premiere college hitter to their farm system. The 21-year-old Madrigal hit .406//.470/.586 in 133 at-bats as a junior with more walks (13) than strikeouts (5). Despite being listed at just 5-foot-7, he was considered by many scouts to be the best hitter in this draft. Whether he develops much power relative to his size is uncertain, but the consensus seems to be that he has a keen sense of the strike zone and superb bat-to-ball skills. Madrigal is listed as both a second baseman and a shortstop, but where he ends up long-term is to be determined. There will be a lot of questions about how the White Sox infield situation will turn out with Madrigal in the fold and both Tim Anderson and Yoan Moncada going nowhere soon. But Nick Hostetler said recently that the White Sox were focused on best player available instead of positional fit, a completely logical stance given the unpredictability of how a roster is going to look three or four years down the road. The pick, according to most projections, came down to Madrigal or Florida pitcher Brady Singer, and that wound up the case when the Phillies passed on Madrigal in favor of Wichita State’s Alec Bohm. As an advanced college bat, Madrigal is also seen as someone who could potentially move quickly through the system, but will likely head out to Arizona once Oregon State’s season comes to an end. In the second round, the White Sox drafted Oklahoma University outfielder Steele Walker. Walker is a 5-foot-11 junior who hit .352/.441/.606 for the Sooners this season. A 21-year-old lefty, Walker’s carrying tool is his bat, as MLB.com says that’s his lone above-average skill and his glove will likely wind up in left, although he played both right and center in college. He performed well both with Team USA and in the wooden-bat Northwoods League in recent years. While the White Sox may have merely been drafting strictly “best player available” on their board, as Hostetler indicated, in Madrigal and Walker they appear to have grabbed two of the more advanced college bats in the draft. So not only did they pass on Singer like I hoped they would, but he dropped like a stone to…the Royals. Poetic. Beautiful. Both of these guys have slash lines that you have to love and the fact they went for bats instead of arms with both picks means that this plan could really be starting to come together soon. Very excited for the future of this team.